Michelle Obama defies the boxes in which women have been caged, expanding the force field of feminism in ecumenical and unsettling ways. 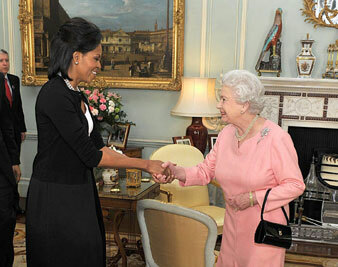 Michelle Obama greets Queen Elizabeth during the G-20 summit. In 1985, Deborah Gray White published her now-classic little book, Ar’n’t I a Woman? This gem of historical research examines the archetypes by which slave women in the plantation South were confined–the brazen, sexualized Jezebel; the domineering, emasculating Sapphire; the dependable, selflessly neutered mammy; and the perpetually loveless, suicide-inclined, tragic mulatta. These tropes haunt black women still: from the adventures of Flavor Flav and Strom Thurmond to the depictions from Don Imus and the minstrelsy of Tyler Perry. It’s not easy living on the receiving end of this unhappy iconicity. That’s why so many minority women are so smitten by the work that Michelle Obama performs, if at a purely symbolic level. She defies the boxes into which black (as well as many Latina, Asian and white) women have been caged; she expands the force field of feminism in ecumenical and unsettling ways. I appreciate that there are those who feel that Michelle Obama has been “mom-ified” by the media. But given the centuries during which black women have been relentlessly taxonomized as mammy rather than mom, many black and brown women find this phenomenon paradoxically, even sweetly transgressive. In some ways it’s an echo of the cultural tension within the “women’s lib” movement of the 1960s and ’70s: relatively privileged white women wanted to be liberated into the workplace; relatively exhausted and exploited black women wanted to be liberated from it. It’s a tension that’s still recognizable to some degree, if only as parallel reactionary forces. If Hillary Clinton was dogged by accusations that she was too much the aggressive career woman, Michelle Obama is now besieged with criticism that she’s not nearly careerist enough. I don’t wish to romanticize either the “pricelessness” of domesticity or the econometrics of the workplace. My point is this: what’s frequently missing from the discussion of black women is their role as loving mothers, beloved wives, valued partners, cherished daughters, cousins, relatives. Lord deliver us from the best of our few so-called role models: hard-working, hard-edged disciplinarians, the ultimate iron-willed church ladies. Where, for heaven’s sake, is a picture of black femininity (in particular, that of darker-skinned, nontragic femininity) that might signify beauty, chic, elegance, vulnerability, sophistication? And so Michelle Obama represents a more comprehensive identity for all women, but particularly for black women. Even when she’s just holding court at the head of the White House dinner table, she is a “black woman” performing a “white lady” role–a picture that still causes cultural confusion and anxiety. But Obama is at no risk of being sidelined as perpetual hostess; hers is a well-rounded life, one of multiple roles and layered humanity. She is powerful yet approachable, highly educated yet colloquial, bare-armed but modest, playful but consummately civilized. If we do not always appreciate this at home, consider how she reflects upon our collective image abroad–and I do not mean whether her wardrobe competes with Carla Bruni-Sarkozy’s. She projects a powerfully modern image to conservative constituencies around the globe, whether in the Muslim world; or in Israel, where ultra-Orthodox newspapers recently airbrushed out all the women from a photo of Netanyahu’s new cabinet; or in China, where male children are so fetishized that each year thousands of boys are kidnapped and sold. Then there’s Michelle Obama’s physical embrace of the queen of England. It may be hard for Americans to fully understand the symbolic significance of that encounter, to comprehend the extent to which traditional class hierarchies are reinforced throughout the United Kingdom by a thousand little rituals of deference and yearning. Here’s an example: for many years, an elderly British friend would send me a very nice plum pudding, always purchased from the high-end London grocer Fortnum & Mason. I didn’t realize the entire significance of the gesture until another British friend told me that this was the very gift the queen sent to favored subjects. One year, my Christmas pudding suddenly came from Tesco–the Piggly Wiggly of the United Kingdom. Whatever had I done to fall in my friend’s esteem? It turns out that this was after Princess Diana had been killed. The queen had been roundly criticized for being out of touch with the common people, so the palace tried to reach out to her staff by sending plum pudding from Tesco. My dear friend, a true and loyal subject, had followed suit. This raises a further question: why did the queen feel the need for such downscaling in the wake of Diana’s death? “The princess touched people,” friends told me, meaning that she literally used her hands to touch people, hugging AIDS victims and pulling starving Nigerian babies onto her lap. Royals “don’t do” that, and Diana was adored for her willingness to break this taboo. The queen is old school, however. So when Michelle Obama casually put her arm around the royal shoulders, the act risked being the order of misfortune that ensued when George W. Bush massaged Angela Merkel’s neck. Instead, the palace quickly issued an uncharacteristically warm pronouncement that no protocol had been breached. What was truly remarkable, however, was that the queen, for the first time in her public career, had reached out her frail, white-gloved, little-old-lady hand, the one heretofore used only for waving, and encircled Michelle Obama’s waist. For many throughout the British Commonwealth, particularly in South Asia, the Caribbean and Africa, this was a mime of egalitarianism, an unexpected kabuki theater of respect and mutual regard. Michelle Obama had somehow pulled off a superlatively graceful transgression–a symbolically charged moment of the kind that quietly turns a bit of the old world upside down, yet leaves us smiling at the new world glimpsed beyond.